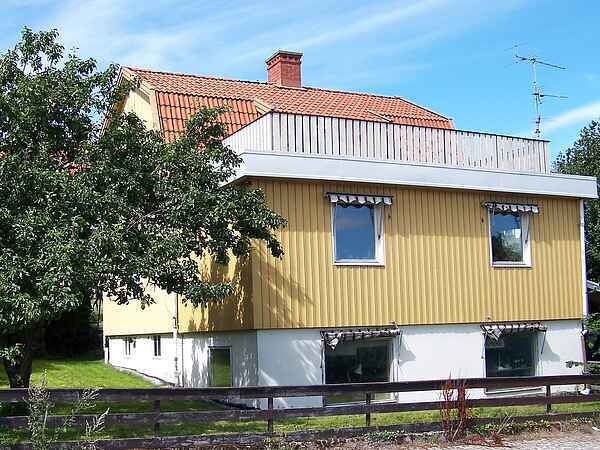 Welcome to this spacious holiday home, centrally located in Strömstad on the west coast of Sweden. The house offers an enchanting view of lake Strömsvattnet and is set close to all sorts of sights and activities. The interior is decorated in a delightful, personal style. Altogether there's one double bed and four single beds in the house. On the bottom floor you will find the kitchen, which features a cooker, a fridge-freezer, and a dish washer. The bathroom features a WC, a washbasin, and a shower. There's also a bedroom on the bottom floor. On the second floor you will find two bedrooms and a spacious balcony/terrace. The house comes with two parking spots. Strömstad is a delightful town set right by the Norwegian border. There are plenty of rocky beaches and you can catch a boat to the islands in the archipelago. Strömstad offers plenty of activities during the summer, as well as many restaurants and little boutiques, which are within walking distance of your holiday home. Why not visit Nordby shopping centre by the border? Golf lovers will enjoy Strömstad Golf. Don't forget to visit the smoke houses and try the local seafood. Or take a trip over the border and visit Fredriksstad in Norway, about 60 kilometres away. Fredriksstad was built in the 1500's.